That's around one-third of the KeyMission 170's original price, which makes this one of the best Black Friday camera deals we've seen so far. If you want to try your hand at adventure photography or you're just looking for the best possible price on a solid 4K action cam, then this £220 saving is just incredible. 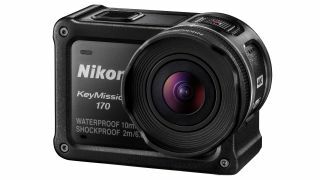 The KeyMission 170 is a rugged, very compact action cam in the rectangular GoPro style. It captures ultra-wideangle 170-degree video and stills (hence the name!) and it's waterproof down to a depth of 10m without any additional casing. If you prefer over-ground adventure, it's also shockproof and designed to survive being dropped from heights of up to 2m. It comes with a rechargeable battery, remote control and both flat and curved base mounts.